Welcome and thank you for signing up for serger class! Serger class is two very busy 2 1/2 hour sessions for a fee of $60 per session. The following information will have you properly prepared for your class. You will be required to undertake a shopping trip independently prior to your class. 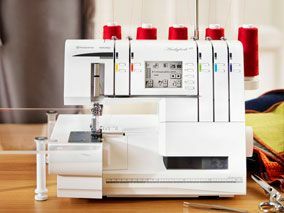 Typically sergers are 2/3/4 thread or you may have chosen a 5 thread serger that will also do a cover stitch as well. The supply list is the same for both sergers, with the difference of the number cones of serger thread to be purchased. 1. Serger one year old (or less) with all original equipment, owners manual available and proof of purchase available. It has been stored in a climate controlled environment. 2. Used serger in good operating condition with proof of servicing within prior 12 months. Has owner’s manual (.pdf of manual accepted) and all accessories. It has been stored in a climate controlled environment prior to and following purchase. No exceptions will be permitted. ***Sergers not meeting the above criteria may be refused at discretion of the instructor upon arrival. Instructor is not responsible for evaluation of serger in need of service. Serger must be fully functional upon arrival. Service fee may be imposed if above conditions are not met. Toldi-Lock serger cones made by Gutermann are recommended. They come in a wide array of colors. The difference between serger thread and regular thread for sewing will be discussed at your session. Initially, please purchase only ONE cone of each of the following colors: Yellow, Red, Green, Blue. If you have a 5 thread serger, please also purchase a Purple cone. Write down the color numbers of the cones prior to unwrapping them and save this information for yourself. Please unwrap the cones prior to class. Your machine may have come pre-threaded, please leave this thread in place. Gutermann Bulky Nylon (alternately available from YLI as Wooly Nylon) is a specialty thread. Its application will be discussed during your class. Please purchase two of these in any color you desire, but preferably different colors. Leave them wrapped at the beginning of class. Fabric for serger class: These can be remnants or scraps of material that you already have. Think very inexpensive here. Have available some of each of the following: tulle (netting), sheer organza, cotton, denim, a slippery, very soft woven that might fray that you would consider difficult to handle (you might refer to this slinky material). Also have an assortment of knits, from a soft, very light t-shirt material, to something you might use for a dress or skirt, a piece of swimwear fabric (not swimwear lining). These materials will aid you in becoming acquainted with your serger and it’s abilities. Inspira Seam Ripper (looks like a surgical scalpel). Available from your local Husqvarna Viking dealer inside Jo-Ann’s. Fray Check – do not open, have straight pin available, and non-fabric scissors for opening. Green threading loops are available on the notions wall. Thread Heaven is found in the notions area of Jo-Ann’s. It is useful when threading your serger. Other threading aids will be discussed during class. Serger owners manual and all accessories. This will include the tweezers and small screwdriver that came with serger. Check the manual to see if your machine has a two-thread converter. Locate it and know what it looks like. We will be discussing and using it during your class if appropriate. Notebook & pen – for taking notes during your class. This project is designed to teach the use of differential feed on a serger. It will be completed during the second class, time permitting. You will be developing & making a full sized standard width ironing board cover & new pad for your own use. ***Use a tabletop ironing board? Ask for a supply list specific to that size ironing board. 45 inch wide cotton fabric (not a dark color, but any other. May be a print if desired) – 2 1/4 yards, laundered, dried, ironed. 90 inch wide Warm & Natural 2 yards. Ironing Board (standard size). If your existing ironing board is a wide one, please contact me for different sizing of supplies. There is a great deal to cover during serger class. Having said that, plan to take lots of notes, but also to have a lot of fun!